I'm a bit concerned about the available outside storage for the 2350. I have an small Weber grill, a screen tent, and 2 camp chairs. Where does one stash these kinds of items? Hi. That is a real issue for us also. What we have had to do since we don't tow a vehicle is decide what we will need on a trip and leave some items at home. 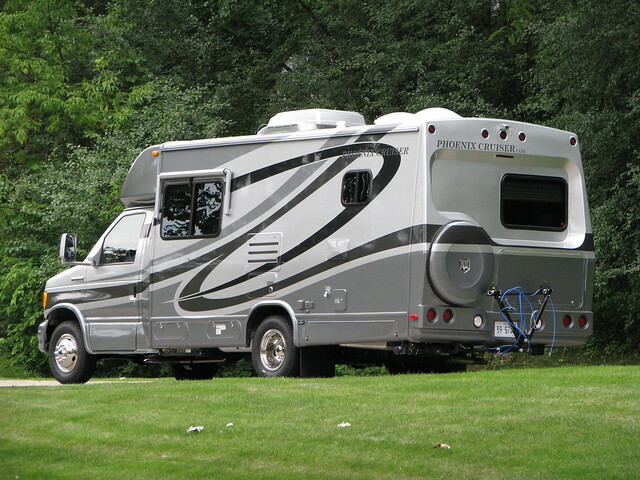 We belong to a camping group and most of the people have larger motorhomes and take the grills. On those outings, we take our two outside chairs. I don't like the idea of tying things onto the back. I suppose if we towed a vehicle, it wouldn't be a problem. I'm anxious to see if anyone else has come up with a better solution to your question. 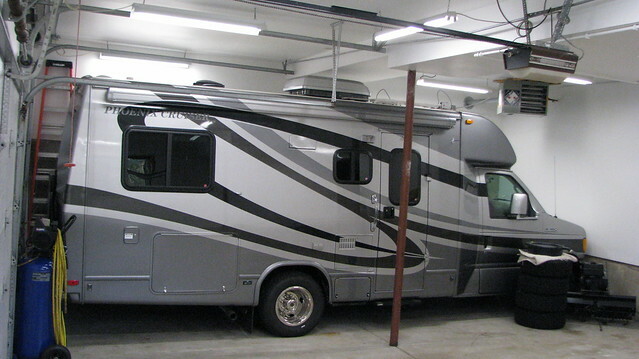 We normally tow a car and it is a good place to put bulky items like lawn chairs and grills. When we don't take the car and need extra space we use a hitch carrier. Here is a link that shows several different types of carries based upon your needs. We use a flat cargo carrier. Storage is a problem for us as well. We have found stackable storage boxes work well behind the drivers seat and we often put large bulky items in the shower while in transit. We slip chairs, a 7 gallon water container, etc., into heavy duty construction grade disposable garbage sacks while they are in there to protect the shower walls and floor. When we got the 2350 to replace our Class B Roadtrek 210, we were aware the useable storage was really less in the PC than the RT. But, we were going to be doing more camping and less touring so we now tow a Jeep Cherokee and it provides lots of storage while going down the road. Everything in any RV is a compromise. If we weren't towing, we would use a hitch carrier. My reply is for those considering special ordering a new 2350 or 2450. Our older 2007 2350 without a slide out seems to offer much more outdoor storage than any current-day 2350 with or without a slide out. Our under-bed outdoor storage (shown below) is quite large. I think both my wife and myself can fit inside it together. We should try that and have our son take a picture. We did have our subwoofer mounted under the front dinette bench which helped. The subwoofer is typically mounted under the bed for consistency with units that don't have a dinette. Design changes since 2007, improved the handling of the rig and later accommodating the fridge in the slide out. But they came at the sacrifice to outdoor storage detailed here. I believe the furnace had to be relocated out from under the fridge because the bathroom and main-room ductwork we have could not move as the fridge moved with the slide out. Having the fresh water tank turned 90 degrees made the outdoor storage compartment very shallow. Relocating the furnace with ductwork under the bed, lost more outdoor storage yet. I wonder if one could custom order a new 2350 today without a slide out but with the setup of a 2007. If I reordered our rig today, I would request that. Actually I would request that in a 2450 along with the larger bed to have even more outdoor storage. I would also request my 3-drawer galley as Carol has done with her 2450. I am just sharing ideas for people like myself with uncommon thinking of a no-slide preference. I am not trying to be a critic at all here, so please don't take it that way. Good points Ron, We also had a RT 210 and have had no problem with storage, was the main reason we bought the 2350 was the additional room,,, we have the dinette and I store our bikes under it.. http://rvbicycleproject.blogspot.com/ I think if anything I would go with a hitch carrier, lots of post on those. Were going back to Alaska next Spring and I'm not worried at all about storage. Thanks for putting that link in for your bike storage project, Sparky. At some point, when everything I need to do subsides a bit, I wanted to check into a folding bike and your storage idea is perfect! We were afraid of the loss of storage when moving from our roomy class A to our 2350. When we started transferring our stuff, we realized how much we were hauling that we rarely used. My husband is brilliant in packing. Somehow he has two nice aluminum directors chairs, a folding table, a grill, and several plastic storage bens in the drawer/ storage. The back storage has fishing stuff and who knows what else. For our fall trip we plan to purchase a lightweight hitch cargo carrier to put our heavy boots and coats or transitional clothing. We haven't missed anything from our class a! We aren't carrying as many groceries, but pulling into a parking lot for a few items is soooo much easier in the PC. Thanks Ron! I do wish the current 2350's had the storage that your 2007 does! If I do decide on the 2350, I'll ask and see what happens. Has anyone used the top with a bag for storage? Just wondering since Phoenix installed a rack on top? Does any hitch box supplier offer a storage box that utilizes a side-by-side tri-hitch like this, ideal for strength and stability. Jim we have had lots of discussion on this topic,,, I would say mostly negative not all..... I did a roof project http://roofprojectfotthecruiser.blogspot.com/ and never used the RV ladder,, I for one do not trust it and if you used your roof then you would be up and down it constantly .. I have used it once and would only use it an emergency while on the road... I know Ron does not even have a ladder on his rig. I know Ron does not even have a ladder on his rig. I requested the ladder and rack to be included, but disassembled and placed inside our rig, not installed on the rig. I wasn't sure if I would regret deleting the rack & ladder, so I wanted them on-hand just in-case I later change my mind. 7 years so far, and no real need for them. The first year we had an incident where I parked our rig in a standard car parking spot and some low hanging tree branches got tangled around the a/c unit. I was able get out of trouble, but I surely would have used the ladder if it was there. That was the only time I questioned my decision, quickly learning to be more careful about that hazard. I seen a number of ladders on other motor homes which never age well. Dirty & poorly formed caulk blobs around each mounting point was another issue to me. I also didn't want so many screw holes in the rear wall and roof, dependent on the caulk to seal. Our rig shown without roof rack & ladder, has a cleaner look to it. With the ladder, our rig would still fit in our garage, but surely would be in the way of getting around it without opening the garage door. That was another factor in my decision. I would give up that space if I could magically change our rig from a 2350 to a 2450.